I took this photo in October at the FastCasual Executive Summit Conference last October in Chicago. Since then, I have been looking at it once in awhile. For some reason, over the last 5 months, this photo feels significant to me, but I have been unable to put my finger on the reasons why. This morning, it dawned on me. I woke with clarity as to why this particular photo is important. And so, I will try to explain. You see, Tom and Barry are from a different generation. A generation that can be easily forgotten, if we are not careful. From my perspective, our community needs to be very careful not to forget our forefathers. Tom and Barry, (and many others), experienced a time in our industry that is critical to our history. Our entire multi-unit restaurant community, as we know it, is based on the principles that Tom and Barry’s generation worked so hard to figure out. They sweated, they laughed and they cried. Of course, they worked under the vision of Ray Kroc and fantastic leaders such as Ed Rensi. Real people, trying to solve real life business challenges. To me, this photo is significant. Not because they are the founders of such important icons such as Ronald McDonald along with Willard Scott and Roy Bergold. Not because of the happy meal. Not because of the advent of drive thru or breakfast. Not because of the philanthropy work of Ronald McDonald house. It is significant because here they are, together, no less than 40 years later, after their team changed the future of the multi-unit restaurant industry. Clearly, they served great leaders in Ray Kroc and Ed Rensi. That is obvious. Great leaders, breed great teams and great people. For me, this photo demonstrates how the key to our industry is the people. Real human beings. Both Barry and Tom have experienced wins, losses, frustration and elation. Their careers span decades of innovation, of passion, of energy and of a belief system that along the way, they were just doing the best they could to make their shareholders happy. They were accountable. When I look at this photo, I see great human beings. I see big hearts. I see humble and gracious wise men. Generosity, creativity, and a desire to simply do the right thing. Regardless of what today’s consumer opinions are about the brand they worked so hard to build, at the time, they were part of a team of true innovators who explored unknown territory. Franchising, systems, technology, consumer awareness. They helped influence pop culture, and they did it by the skin of their teeth. By chipping away every day. By doing the simple things. Of course, they applied business logic to their daily decisions, but I can tell you, growing McDonald’s was hard. It was uncertain. It was scary. Just ask them. They will tell you. “Erle, why is this photo so significant?” You ask. Well, to me, this photo captures the essence of the human spirit that lives deep in our multi-unit restaurant community. Of course, we all work hard. We all try and and be great leaders and we all try to follow visions and great leadership models. For those of us that are slugging it out every day in our businesses, we are experiencing the same challenges, fears, anxiety, stress and elation when things go well, as these gentlemen did under the tenure of Ray Kroc and Ed Rensi. We are no different. We are people who are following our beliefs, adjusting to market pressures and doing what we can to meet the market demands of our customers. We are just trying to survive. To me, this photo is significant because here they are, perhaps 35-40 years later, still slugging it out in our industry, trying their best to make a difference. The world has changed a lot since those days at McDonalds. Just ask them. But no matter. They are still standing. It is significant, because when I look at this photo, I see my future, and the future of so many others that are working hard in our present time to make our industry amazing. We are all becoming a part of history. So I ask you, look into this photo. What do you see? I see generosity, creativity, loving kindness and a true desire to make a difference. I see two gentlemen who have forgotten more about our industry, than any of us currently know. I see experience. I see leadership. Important and relevant history. I see how our industry took shape off the sweat of their backs. Did they know it at the time? Probably not. They were just doing what they knew best at the time. Just like all of us today. As business people we spend most of our time dodging bullets. Once in awhile we get to shoot a few and that is important to our long term ability to survive in our businesses for the long term. Let’s face it, business is hard. It’s just hard. When I looked deep into this photo this morning, it dawned on me. I am simply 30 years behind them. 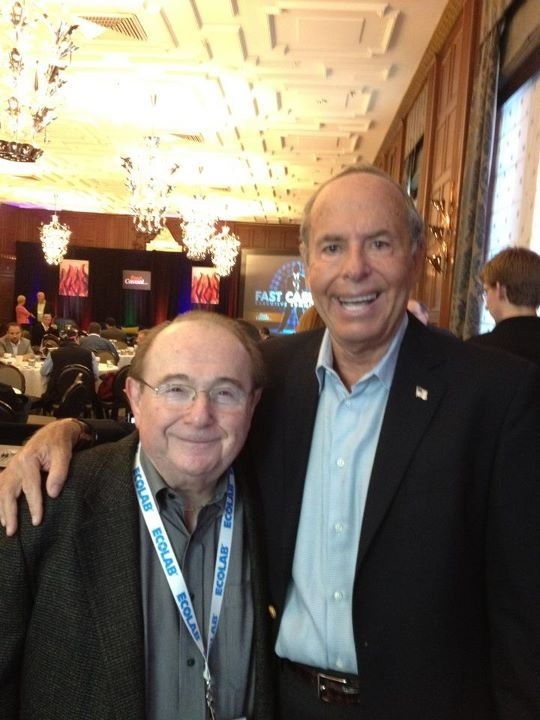 I wonder if in the year 2042, I will still be standing to be in a photo like this at the FastCasual Executive Summit? I’ll be 76 years old, and I wonder what I will have to say at that time? Will I have contributed anything great? I wonder. Of course, just like all of you, I am slugging it out day to day, doing my best to make a difference. Following my belief systems, which is so powerful that it allows me to never give up. I wonder what our industry will look like in the year 2042? It’s just so hard to imagine, to predict. As I look at the significance of this photo, I see myself and many of you. What is our purpose? How are we shaping our industry? How are we making a difference? When will our ideas become dated and stale, only to be forgotten by the next generation? Certainly we believe that each of us is innovating, that we are gaining traction in our businesses. We believe there are profits to be made, otherwise we would be spending our valuable life energy doing something different. I woke this morning looking at this photo and imagined a world where my vision was now behind me and was now part of history. I imagined a challenging path to success. I faced my own reality of wins and losses in my own business. What I realized after a lot of consideration, is that Tom and Barry understand that our industry is all about people. People who show up each and every day. People that just never give up. People with passion, skills and a desire to compete fairly. To run honest businesses. By the year 2042, I will be in that photo, if I am fortunate enough to be accepted as a contributor. As an individual that cared enough to make a difference. As an innovator. More importantly, I would be fortunate to have as many friends and colleagues as both Barry and Tom. And so, I felt compelled to celebrate our forefathers by writing in my blog today. Of course, there are many others that are of equal if not greater importance in the history of our community, but when I took this photo, they were not around. And so, as I sign off today, to rest my brain so that I can slay more dragons tomorrow, I find myself inspired by these two individuals. Not only because of their contributions and effort, but because they are amazing human beings. Both of them. Always lending a hand, an ear and sound advice. I should be so lucky to be as successful as these great leaders in our community. Please don’t forget to take care of our elders. Call them and say thank you. They deserve it. They have a lot to share with us. They have a lot to teach us. They have a lot to offer us. I am honoured to know both of these great leaders, and while I recognize that the paradigms in our industry have shifted, there is a theme that remains consistent through time. Be generous and be kind. Be humble and be helpful. Give back. Pay it forward. That is what I see in this photo. Inspiration, generosity and a willingness to survive. To never give up. To fight hard for what you believe and to ignore the naysayers. To carry on our work, in the face of adversity. Just look at their faces. The stories they can tell are fascinating. I encourage each of you to take time out in our community, source out experienced leadership and pay your respects. Ask your questions now so that we may listen and learn. Then adapt and adopt and commit to yourself to be great leaders in the years to come. Pass the knowledge to future generations and make sure you never forget about our forefathers before us. These are the people that influenced pop culture and changed an industry. History was made. So I ask you, what are you doing in your business that makes you worthy of being in a photo like this at the FastCasual Executive Summit in 2042? To give you a hint, I recommend that you practice loving kindness, generosity and define what truly makes your organization great in the years to come. Listen and Learn. A picture is worth a thousand words. I want to say thank you to these two great leaders. Thank you for slugging it out. I would not have the opportunity to do the work that I love, if not for your sweat and tears. I remain forever grateful to both of you. Also, thank you for keeping it loose and making it fun. The fun is what makes it all worthwhile.